I live in the heart of tornado alley, in fact I live within 20 miles of the very powerful EF5 that struck Moore, OK and the largest tornado ever recorded just a few days later near El Reno, OK. Aside from a very near miss the day before the Moore tornado and spending this past weekend repairing my fence I’ve come out mostly unscathed as this year’s tornado season starts to wind down. Not that I take joy in others’ misery but a fortunate thing occurred this past month as a result of the massive damage and lives put on hold. AT&T decided to lift most voice and data restrictions for those in the affected area for a month. Apparently that included me. You see I’m one of the dwindling holdouts who purchased an unlimited data plan. AT&T wooed me into another contract with the promise to grandfather my unlimited data plan in only to throttle me two months later. That’s been about two years ago now and I’m still very bitter about it. I pride myself as being one with common sense and knowing when to timely interpret the writing on the wall but on this issue I’ve decided to dig my heels in. If there’s not a clearer issue of false advertisement I haven’t seen it and I just can’t understand why one of those big brother federal agencies you always hear about haven’t stepped in yet to squash the practice of throttling users with unlimited data plans. I’ll get off my soapbox for now and get to the meat of this post which is what I did with a month of unfettered data access on a device running on arguably the fastest LTE network in the states. To start I simply unleashed the reigns on one of my favorite music apps Songza. 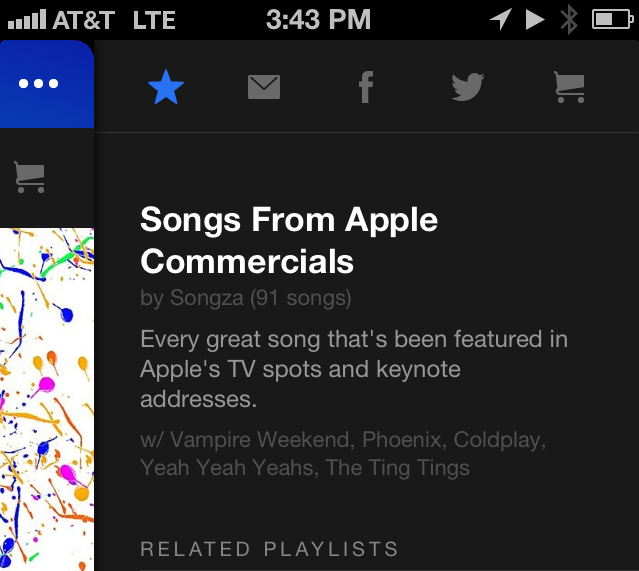 Songza is one of many music streaming apps whose approach differs by allowing you to choose playlists by the mood you’re in. It’s also got a great pool of playlists created by artists and brands. Tip: check out the Songs From Apple Commercials playlist, it’s fantastic and surprisingly lengthy. It’s fair to say I streamed from Songza at least four hours a day. When I was in the mood for a specific artist or song I happily tuned in to Spotify and selected my choice at will at its extreme music quality setting no less. This was a welcome experience after months of dealing with Spotify’s confusing interface and juggling my iPhone’s limited data storage when on wifi just to download the next day’s playlists. If I ever felt in the mood for one of my own albums stored in iCloud I guiltlessly downloaded at will scoffing at the data warnings barked at me. When tired of music I easily cleared out my queue on my Hulu app. Now I don’t typically spend much time on YouTube except to view a video link I come across through the digital universe but I must say I got into the spirit quite easily a couple of times as I chased a couple rabbits after viewing a link. There were a couple of video podcasts that I usually would wait to download offline that I purposely streamed because I could. When it came to watching Apple’s 2 hour long keynote speech and iOS 7’s unveiling at this year’s WWDC I skipped my employer’s putrid internet connection in lieu of my iPhone’s Safari stream. The whole experience was quite liberating to be honest. When the dust finally settled I had burned through 10 GB of data twice the normal amount I’m allotted on my unlimited data plan before being throttled on LTE (note: it is 3GB if you’re on a HSPA+ only device). To be truthful I probably am the type of user that the powers-that-be at AT&T legitimize the decision to throttle but I must ask why else build the LTE network? Relaxing restrictions for tornado ravaged victims was quite gracious of AT&T no doubt but I must say there’s massive amounts of irony in the fact that I finally got to experience my promised unfettered access on my LTE enabled device as a result of restrictions lifted to help victims. Here’s some unsolicited advice AT&T, if you want to create some sort of brand loyalty, don’t offer your customers the promise of the the fastest network in America by getting halfway there by limiting their access. Final thought, the folks at Chevrolet could make the Silverado the most fuel efficient truck in history overnight by adjusting the speed governor to 35 mph right? Is this a fair comparison? Sorry I just couldn’t stay off my soapbox.